The R-PLEX Human HAVCR1/KIM-1 Antibody Set includes a matched capture and detection antibody pair and calibrator for the quick and easy measurement of HAVCR1/KIM-1 in biological samples. R-PLEX products leverage MSD’s electrochemiluminescence technology for better sensitivity and a larger dynamic range than traditional ELISAs. R-PLEX matched antibody sets enable the development of singleplex and multiplex immunoassays. Individual assays may be developed using MSD avidin- or streptavidin-coated plates. Custom multiplex assays with any combination of R-PLEX analytes, as well as R-PLEX plus U-PLEX analytes, can be developed on U-PLEX MULTI-SPOT plates. To learn more about the advantages of R-PLEX products click here. 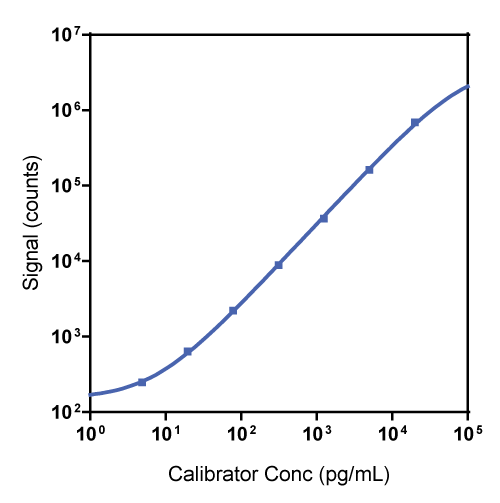 Calibration curve for the R-PLEX Human HAVCR1/KIM-1 Antibody Set was assessed and representative data are presented below. Description - Hepatitis A Virus Cellular Receptor 1 (HAVCR1, KIM-1, TIM-1) is a type 1 transmembrane glycoprotein found on activated CD4+ T cells, especially Th2 cells, and dedifferentiated proximal tubule epithelial cells. In humans, HAVCR1 levels are very low or undetectable in normal samples, but following damage to the kidney, elevated levels are detected in urine, serum, and plasma. Therefore, HAVCR1 is a suitable biomarker for acute kidney injury research. Urinary biomarkers track the progression of nephropathy in hypertensive and obese rats. Application of emerging biomarkers of acute kidney injury in development of kidney-sparing polypeptide-based antibiotics. Assessment of cisplatin-induced kidney injury using an integrated rodent platform. Early prediction of polymyxin-induced nephrotoxicity with next generation urinary kidney injury biomarkers.